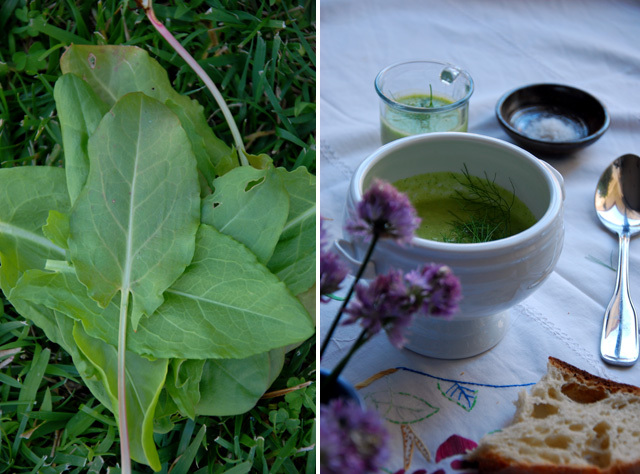 Hi, my name is Helene, from French Foodie Baby, a blog about family cuisine and the journey of teaching my child the value and appreciation of good food and all it can bring into our lives: nutrition of body and soul, connection in family and friendship, the enjoyment of life. I'm thrilled to be doing this guest post on Artsy-Fartsy Mama and very grateful to Lindsay for giving me this opportunity to present her readers with a fun little challenge: today being Julia Child's 100th birthday, why not pay her tribute and be French for a meal? The French, at home, typically eat a "four-course meal", though it's often not as fancy as it sounds. Dessert: Yogurt, or a piece of fruit. 1. You (and the kids) get to eat the veggies first, when you're most hungry. 3. It is balanced with all the categories of food covered, and a lot of vegetables. Bon appétit! And happy cooking! Cooking time: This is fairly quickly made, 10-15 minutes, but does need to chill for a few hours. You can make it the day before or a few hours ahead. Drain and squeeze the water out of the soaking bread. Place wet bread in a blender. Add the fennel and some of the cold water and blend on high until liquefied. Add the cucumber, sorrel, bell pepper, cumin, vinegar, olive oil, salt and rest of water, blend on high until very smooth. Place the blender pitcher, covered, in the fridge for a couple of hours at least, until chilled. When ready to serve, blend it one more time for a few seconds, and pour in bowls. 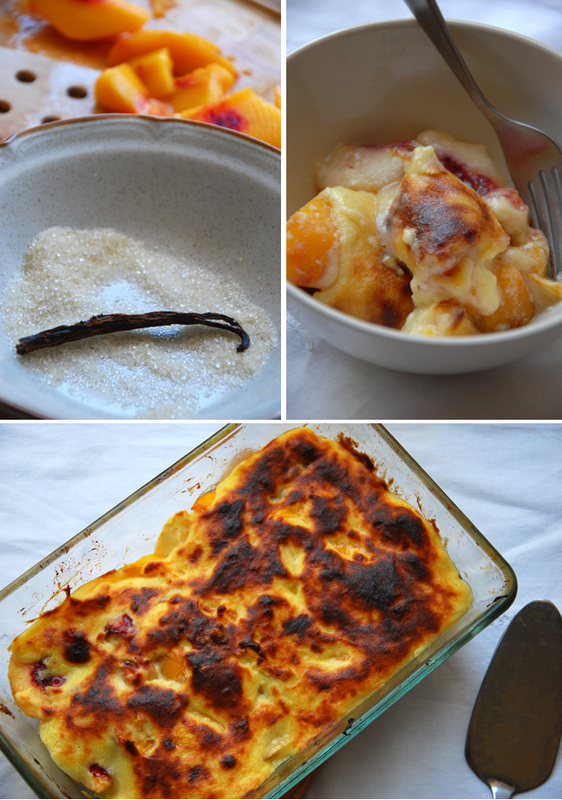 Adapted from At Home with French Classics by Richard Grausman, as well as my mother's recipe. Cooking time: Ok, I'll admit this is a bit involved. You should count about 90 minutes to complete this dish, with some downtime while it cooks. But it is well worth it and is even better the next day! Place the veal in a large casserole or Dutch oven and pour 8 cups of cold water over it. Bring to a boil, skimming the foam from the surface frequently. Meanwhile prepare the bouquet garni: take a piece of celery stalk, cut it in half lengthwise. Place 2 or 3 sprigs of fresh thyme in the hollow of the stalk, cover with 1 bay leaf and 4 or 5 sprigs of Italian parsley. Cover with the other half of the stalk and tie together with kitchen twine (see photo above). As soon as the water with the veal boils, add the studded onion, the carrot, leeks, turnip, celery and the bouquet garni (all the vegetables go in whole, as they are not meant to stay in the dish, but to give the stock flavor). Reduce the heat* to a gentle simmer, cover and cook for 30 minutes. Add the pearl onions (if they're frozen, just run some cold water over them first) and simmer (still covered) on low for another 35 minutes. 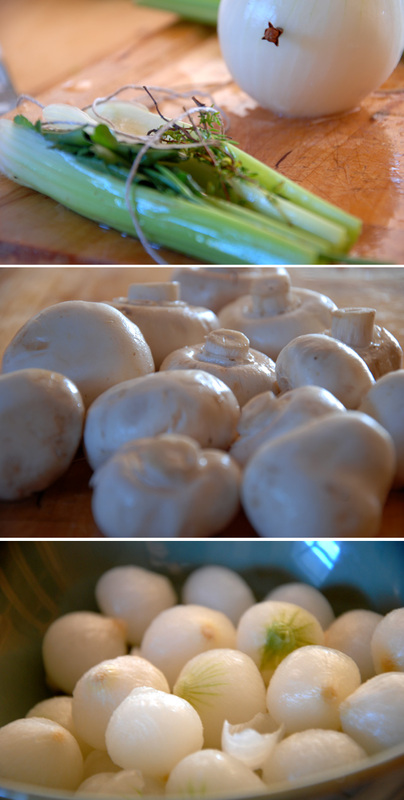 Add the mushrooms and cook for another 10-15 minutes. Drain the meat and vegetables, reserving the stock. Put the veal, pearl onions and mushrooms in a large saucepan. Discard the bouquet garni. The remaining vegetables (leeks, celery, turnip, carrot, half of the onion) are typically discarded, but I find that to be a shame. If you have a baby, toddler or young child, mixing all those veggies makes for a very tasty soft puree with lots of vegetables. You can mix in a food processor and place in 2 oz container (or ice-cube tray), and freeze if needed. Cook the rice in a saucepan or rice cooker, using 2 cups of the stock and 2 cups of water. Reduce the remaining stock by boiling over high heat (uncovered), until you have about 3 cups left. In a small saucepan, heat the butter over medium high heat. Add the flour, and cook, stirring frequently, until the mixture (called a roux) is pale yellow and frothy, 30 to 40 seconds. Add 2 1/2 cups of the reduced veal stock, and whisk until the sauce thickens and comes to a boil, 2 or 3 minutes. Reduce the heat to maintain a gentle simmer, and add salt and pepper. Whisk vigorously for 10 seconds. Simmer gently, whisking from time to time, until the sauce is the consistency of heavy cream, about 5 minutes. Skim off any butter at the surface. Reduce the remaining 1/2 cup of reserved veal stock over high heat, until only a few teaspoons remain, and whisk that into the sauce. Remove the sauce from heat. In a small bowl, mix the egg yolks and cream together, and gradually whisk in 1/2 cup of the warm sauce. Then whisk the egg/cream mixture back into the rest of the sauce. Return to the heat, bring to a simmer, whisking constantly. Remove from heat and pour it over the veal, mushrooms&nbsp;and pearl onions, coating them with the sauce. 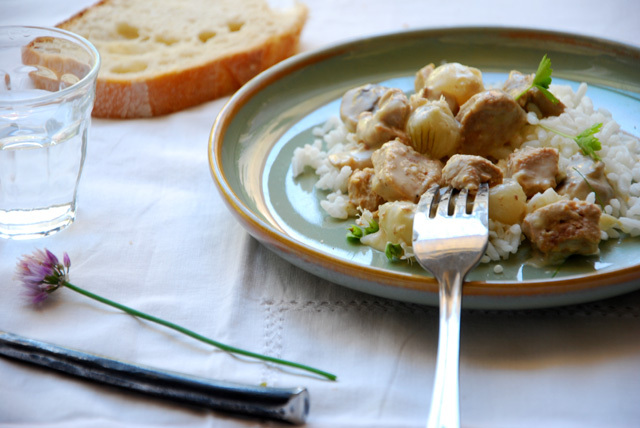 Serve a portion of rice, with the veal and sauce mixture on top, spoon over some extra sauce. Bon appétit! 1. This keeps very well and is known to taste even better the next day. You could even make it (the veal, not so much the rice) a day prior to serving it. Just let cool, cover and refrigerate. Reheat in a boiling water bath: by placing the veal in a bowl, and placing that bowl in a larger pan with boiling water over low heat. Stir gently and reheat for about 15-20 minutes. 2. I highly recommend finding veal shoulder, and not settling for veal "stew meat" or other cuts you might find. Shoulder meat is very tender and perfect for this dish, otherwise, the meat might be somewhat chewy. 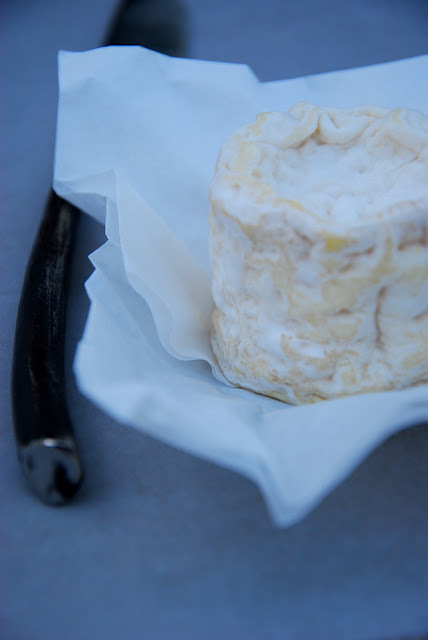 Serve cheese as the French do, towards the end of the meal, with a simple green salad with vinaigrette (1 part vinegar, 3 part oil, 1 tsp Dijon mustard, salt and pepper), to help digest. Cooking time: This takes about 30 minutes total to make, but I swear, it is like a warm cloud of summer in your mouth! In a saucepan, combine the milk and cream. Cut the vanilla bean lengthwise and scrape the seeds into the milk cream. Toss in the bean as well. Bring to a light boil, remove from heat and cover, letting the vanilla infuse for about 10 minutes. Remove the vanilla bean. 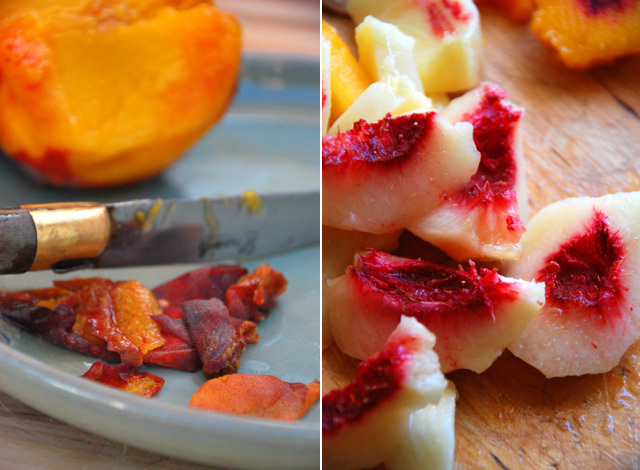 Meanwhile, peel the peaches, take out the stone and quarter them. Butter a baking dish. 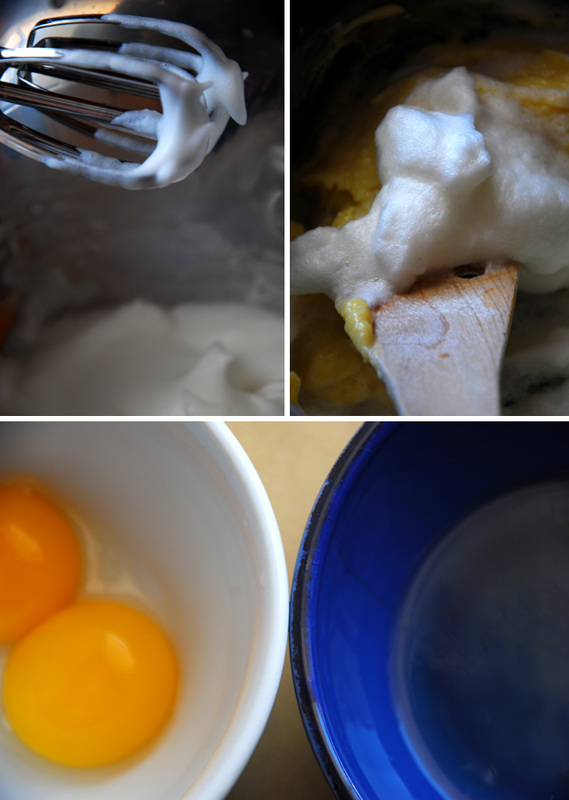 In a large bowl, whisk the yolks with the sugar, add the flour. Then add the milk/cream/vanilla mixture, whisking well. Pour the whole thing back into the saucepan and bring to a boil, stirring constantly. It will thicken into a cream consistency. Remove from heat and let the cream cool completely. Preheat the broiler at 500°F. Beat the egg whites with a pinch of cream of tartar until they form peaks. Incorporate gently into the cream, "folding it in" (don't stir) with a rubber spatula. Cover the peaches with this mixture. Place in the broiler (in the middle of the oven) for about 5-7 minutes, until golden on top. Take out of the oven and let it cool down to warm. 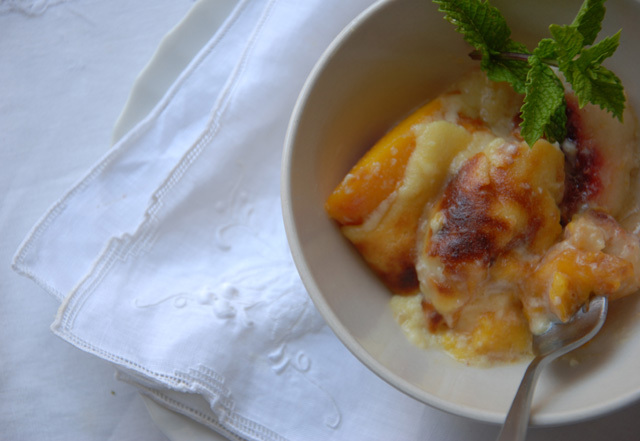 That peach gratin soufflé looks so wonderful! Great post! 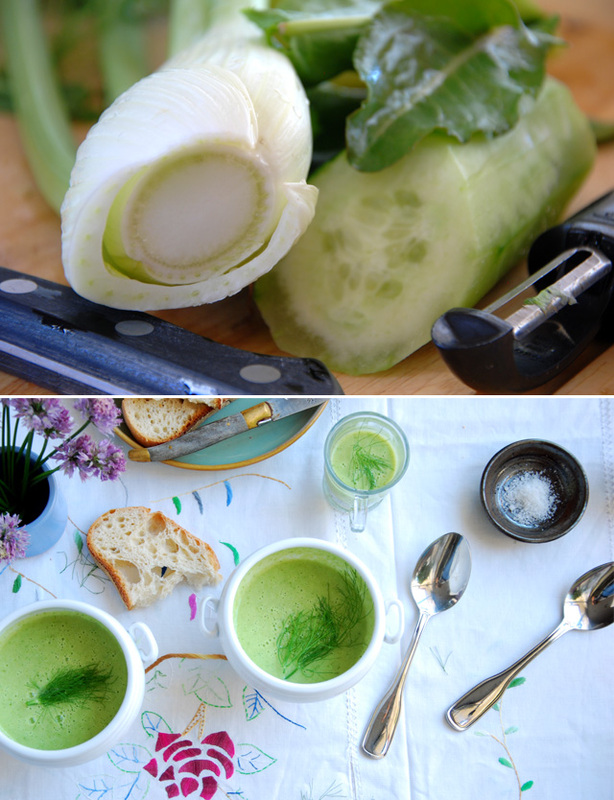 OH MY GOSH, all of those pictures are beautiful and I'm dying over that cucumber soup!! What great recipes. Thanks so much for stopping at Artsy-Fartsy Mama. I can't wait to check out more of your site! Heading there now! What a fun post-so appropriate for Julia's birthday. This sounds like a fun little challenge. Thanks for the great recipes. This all looks so delicious! Your meals remind me so much of italy and the different courses! Man, I love Europeans!